You can probably still hear the lingering fireworks from the person in your neighborhood that has decided to shoot off the final few leftovers in their arsenal. Our 4th of July celebrations, American flags on display and everything red, white and blue just occurred in towns and cities all across America. We Americans love to celebrate our country. 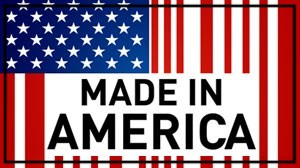 Let’s take a moment to celebrate some American made products from a company headquartered in Ripon, Wisconsin. The Speed Queen washer and dryers are commercial quality units, the biggest difference between the commercial and residential units is the coin slot. Speed Queen washers and dryers also carry a 5 year warranty, with a life expectancy of 25 years. This brand carries a reputation of being highly durable, having no frills and superior quality. Please take a moment and watch the video below…..a real life commentary that speaks to the performance of Speed Queen. Stop by the showroom and let our sales staff show you our display of Speed Queen laundry….we have an impressive display of laundry product including a variety of brands and price ranges, I am confident we can help you find the perfect match for you and all your laundry needs. *** Don’t forget to check out our Clearance page for the latest markdowns…..
Thankfully, we no longer need to beat our clothing on stones by a river, scrape them across a washboard, or use a machine that can catch arms, hair, small animals, etc, if you weren’t careful (see said torture device below). We have options. Top loading machines (with or without agitators) and front load machines, are the choices currently on the market. Could laundry (I dare say) be a joy?! Fun!? I bet you want to know! My current personal favorite is a little known, but an outstanding performing brand from New Zealand, Fisher & Paykel. They offer three top loading washing machines with two AeroCare dryer options in electric and gas. Their washers clean 22 lbs of laundry with a 49 dBA sound rating. So if quiet and large loads are important to you….keep reading. Fisher & Paykel SmartDrive™ machines have three important parts that make their machines wash so well. A direct-drive motor, flexible agitator, and a computer all work together to adjust to the size of the load. The computer gives feedback to the machine so it adjusts spin speed and water levels, all in the name of clothing care. With less parts and less water usage, you have a machine that can clean and doesn’t require a whole lot of maintenance. Fisher & Paykel laundry is all about clothing care, getting the dirt out of the grimiest loads while being gentle on your delicates, too. Their agitator model offers three water levels using WashSmart™ (giving you a true fill to the top option). The water levels in the non-agitator models rise to the level of the clothing in the wash basin using AquaSmart™ technology (great for energy savings). It is large enough to hold comforters and blankets. Their machines come with a full 2 year parts and labor warranty, with 8 additional years on the direct drive motor. With models starting at $799 for the washer, and $799 for the electric dryer….they are also well within reach of most laundry room daydreams or your soon to be reality. Stop in today to see them for yourself and start making laundry day an actual joy! Comedian Zach Galifianakis once said you know it’s time to do the laundry when you dry off with a sneaker. Here’s an option before it ever gets to that point. ASKO laundry was inspired and created by a young Swedish farmer, Karl-Erik Andersson, in 1950. His vision and creation even astounded his mother who apparently wasn’t that easily impressed. His inspiration and creation have brought us all a fantastic option for either a main laundry set or a second set for another area of the house. If you are looking to protect your clothing, be more energy conscious, and have thorough, low chemical cleaning of your clothing, you may be interested in what ASKO has to offer. They have been in the front load laundry business way before it ever became the norm and haven’t had many of the issues consumers have faced with other brands. Let’s explore “why” together, shall we? ASKO units have never had an odor problem. The washer drum is hard mounted as opposed to having a soft bellows gasket, which equals zero mold growth. No science experiments here, sorry. The drain pump line is easily accessible since it’s accessed from the front of the machine. Do you know why this is important to you or me? Because we leave things in our pockets, that’s why. Toys, gum, coins, really big lint, etc. This handy-dandy feature let’s you clean out anything that gets caught in there eliminating costly service calls. There are shocks in the bottom of the washer unit keeping vibration low as it spins out your clothing at 1200-1400 rpm depending on the model. It’s smart, too! It is a cold water only hookup so the machine controls the water temp and heats it to the proper temperature based on the cycle selection. The units can be vented or non-vented. They plug into each other and come with their own stacking kit. You can kiss your bleach goodbye since their machines heat water to 205 degrees. Detergent and fabric softener usage is also reduced since the machine relies mainly on temperature and wash technique to clean your clothes, not chemicals. No detergent is left on the clothing after a wash and so it doesn’t get baked into your clothes in the dryer. So before you ever resort to drying yourself off with a sneaker give ASKO a shot at impressing you. If Karl-Erik was able to impress his mom who was insistent on the highest of standards, maybe he can impress you, too.